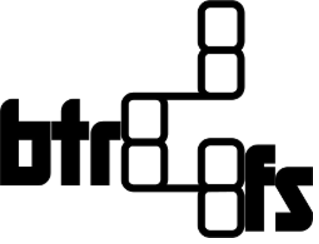 Btrfs is a modern copy on write (CoW) filesystem for Linux aimed at implementing advanced features while also focusing on fault tolerance, repair and easy administration. Btrfs is designed to be a multipurpose filesystem, scaling well on very large block devices. OpenZFS is a combined file system and logical volume manager include protection against data corruption, support for high storage capacities, efficient data compression, integration of the concepts of filesystem and volume management, snapshots and copy-on-write clones, continuous integrity checking and automatic repair. ZFS does away with partitioning, available disks (of any size) are used to the best of their ability. Compression can be used to increase bandwidth. ZFS is 128-bit, meaning it is very scalable. (e.g. 16 exabyte limit). State-of-the-art unsurpassed data reliability (including silent corruption detection and automatic data repair, if available) from end to end, thanks to transparent checksums in parent block pointers. From one point of view, the two file systems are very similar: they are copy-on-write checksummed file systems with multi-device support and writable snapshots. From other points of view, they are wildly different: file system architecture, development model, maturity, license, and host operating system, among other things. Btrfs organizes everything on disk into a btree of extents containing items and data. ZFS organizes everything on disk into a tree of block pointers, with different block sizes depending on the object size. btrfs checksums and reference-counts extents, ZFS checksums and reference-counts variable-sized blocks. Both file systems write out changes to disk using copy-on-write – extents or blocks in use are never overwritten in place, they are always copied somewhere else first. Btrfs is more suitable to storage than that of ZFS. One of the major problems with the ZFS approach – “slabs” of blocks of a particular size – is fragmentation. Each object can contain blocks of only one size, and each slab can only contain blocks of one size. You can easily end up with, for example, a file of 64K blocks that needs to grow one more block, but no 64K blocks are available, even if the file system is full off nearly empty slabs of 512 byte blocks, 4K blocks, 128K blocks, etc. In contrast, the items-in-a-btree approach is extremely space efficient and flexible. Defragmentation is an ongoing process – repacking the items efficiently is part of the normal code path preparing extents to be written to disk. Doing checksums, reference counting, and other assorted metadata busy-work on a per-extent basis reduces overhead and makes new features (such as fast reverse mapping from an extent to everything that references it) possible.